Hard-core cyclists will tell you there's no better way to get around the city than by bike. You can zip past traffic, head the wrong way down one-way streets, avoid parking headaches and shake your head at the crowd of people waiting for a bus that never comes, thanks to the incredible shrinking CTA. In the market for a new ride? We'll help you make an informed purchase. They're shiny, they're pretty and, if assembled correctly at the store, they'll require little to no tinkering to fit specific needs. What the nationwide chain Performance Bicycle Shop (2720 N Halsted St at Schubert Ave, 773-248-0107; and in Naperville and Northbrook) lacks in selection and street cred, it makes up for in friendliness and perks, like its 90-day price adjustments and free tune-ups for the lifetime of the bike. Here, you'll find more than 200 road bikes (up to $2,000) and hybrids ($200–$500) from Giant, Fuji, Tirreno andSchwinn, plus ample accessories. The family-owned, Chicago-based Kozy's Cyclery (601 S LaSalle St at Harrison St, 312-360-0020; 1451 W Webster Ave atClybourn Ave, 773-528-2700; 219 W Erie St at Wells St, 312-266-1700; 3712 N Halsted St at Waveland Ave, 773-281-2263) carries road and mountain bikes from Cannondale,Schwinn, Specialized and Giant ($200–$4,000), and cruisers, choppers, recumbents and tandems ($320–$925). While selection is good, customer service is lukewarm. Kozy's can't guarantee a quick in-and-out experience, but its ubiquitous locations put it in the same league, in terms of merchandise volume, as Village Cycle Center (1337 N Wells St at Evergreen Ave, 312-751-2488). 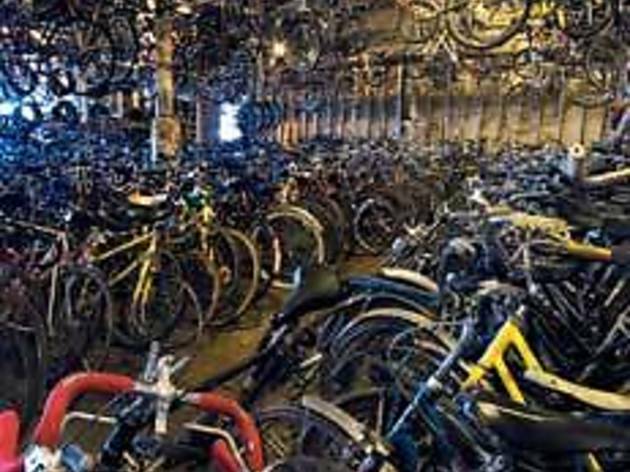 Village lays claim to the largest inventory of any bike shop in the nation, with a staggering 10,000 bikes in its stockroom and 300 on display. It's got a big, efficient sales staff to handle the often-chaotic customer traffic. Most sales are comfort and hybrid bikes ($300–$400), and Village will sell older models at a 25 to 40 percent discount. The store doesn't allow outdoor test rides, which turns off some customers, but you have seven days to return a bike for a full refund. On the Route (3146 N Lincoln Ave between Belmont and Barry Aves, 773-477-5066) is a small neighborhood shop that swaps the big inventory for attentive service. Expect road bikes by Bianchi and Trek ($570–$4,000); mountain bikes by Trek, Marin and Cannondale ($220–$2,500); and Nirve cruisers in trendy Paul Frank and John Deere styles ($250–$450). The repair shop gets high marks, too. Turin (1027 Davis St at Maple Ave, Evanston, 847-864-7660), another independent that shines with good service (it'll adjust parts to fit your frame when you test-drive a bike), offers a sweet selection of new wheels and dependable mechanics. For specialty models, new bikes are the way to go. Through The Bike Rack (2930 Campton Hills Rd just west of Route 64, St. Charles, 800-711-BIKE), you can buy hard-to-find hand cycles, as well as traditional bicycle models. Rapid Transit Cycle Shop (1900 W North Ave at Wolcott Ave, 773-227-2288) is one of the best stores for recumbents and folding bikes (along with conventional styles), and it's also one of the few that can handle hand-cycle repairs. 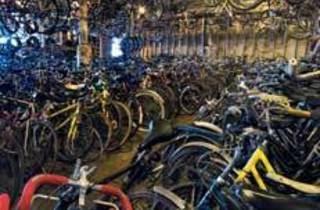 Purchasing a used bike makes a lot of sense—and not just because you're keeping it from ending up as scrap metal. Used bikes are cheaper, the selection is usually wider and they offer plenty of opportunities formodifications. One of the best places to get a used ride is the Working Bikes Cooperative (1125 S Western Ave between Roosevelt Rd and Grenshaw St, 312-421-5048). This volunteer-run nonprofit obtains landfill-bound bikes through scavenging and donations, and then restores them to working condition. What's more, all profits go toward sending repaired bikes to Third World countries for people who need them the most. You'll find a huge selection of 10-speed road bikes and the occasional cruiser or mountain bike at the co-op's retail storefront (open Sat, Sun and Wed, noon–5pm) for an average price of $55. At Uptown Bikes (4653 N Broadway between Wilson and Leland Aves, 773-728-5212), another purveyor of used bikes, you'll most likely find 21-speed hybrids and mountain bikes ($250 on average), custom builds and a well-organized selection of used parts. Used road bikes tend to go quickly. Logan Square's Boulevard Bikes (2535 N Kedzie Blvd between Linden Pl and Logan Blvd, 773-235-9109) acquires used bikes through trade-ins and from Working Bikes. (Instead of restoring them to minimal working condition, however, Boulevard completely rehabs its bikes.) You'll mostly find 10-speed road bikes from the '70s and '80s, plus the occasional Schwinn 3-speed or Raleigh cruiser ($100–$300). Boulevard can also service hard-to-repair models like hand cycles. On the far South Side, Hegewisch Cycle & Hobby Shop (13403 S Brandon Ave at 134th St, 773-646-2584) is as mom-and-pop as it gets. Amid the hobby supplies are tricycles, 20-inch BMX-style bikes and pink 10-speeds ($20–$29) for kids. Adults will find mountain bikes, single-speed coasters and 10-speeds in a slew of 1970s colors from no-name brands ($35 on average, cash only). Or, you could simply go to the Chicago Police Department Public Auction. Once a month, the fuzz auction off stolen property that's been recovered, but not claimed, at the West Side Technical Institute (2800 SWestern Ave between 28th and 31st Sts). Auctions start at 10am Saturday, and bikes go first. Expect to see 40 to 70 bikes, which, depending on the pedigree, go for $5 to $800 (cash bids only). Previews are on the preceding Friday, 1–3pm, and on auction day, 8:30–10am. Upcoming auctions: June 25, July 23, August 20 and September 24. For more info, call 312-743-1298.